For other people named Edward Bates, see Edward Bates (disambiguation). Edward Bates (September 4, 1793 – March 25, 1869) was an American lawyer and statesman. He served as the first attorney general of Missouri after it was admitted as a state. He served as the United States Attorney General under President Abraham Lincoln from 1861 to 1864, and was notable as the first cabinet member to be appointed from west of the Mississippi River. He was a member of the Bates family, which included brothers Frederick and James. Born in Goochland County, Virginia, to Thomas Fleming Bates and his wife, the former Caroline Matilda Woodson (1749-1845). His father was a Goochland County native, having been born on his family's Belmont plantation, and served in the local militia, including at the Siege of Yorktown at the end of the American Revolutionary War. Like his siblings and others of his class, Bates was tutored at home as a boy. When older, he attended Charlotte Hall Military Academy in Maryland. Edward Bates studied the law with Rufus Easton and boarded with his family. Easton was Judge of the Louisiana Territory, the largest jurisdiction in U.S. history since the Louisiana Purchase. After being admitted to the bar, Bates worked as a partner with Easton. Bates's private practice partner was Joshua Barton, who was appointed as the first Missouri Secretary of State. Barton became infamous for fighting duels on Bloody Island (Mississippi River). In 1816 Bates was the second to Barton in a duel with Thomas Hempstead, brother of Edward Hempstead, the Missouri Territory's first Congressional representative. The fight ended without bloodshed. Barton was killed in a duel on the island in 1823. Bates's first foray into politics came in 1820, with election as a member of the state's constitutional convention. He wrote the preamble to the state constitution—an honor that later influenced his fight against the radical Missouri Constitution of 1865. He next was appointed as the new state's Attorney General. After she gained her freedom, she enlisted Bates's support as her attorney in the separate freedom suit she filed for her daughter Lucy Ann Berry, then about age 14. According to the principle of partus sequitur ventrem, since the mother had been proved a free woman at the time of her daughter's birth, the court ruled that Lucy was also free. During this time, Orion Clemens, brother of Mark Twain, studied law under Bates. In 1850, President Millard Fillmore asked Bates to serve as U.S. Secretary of War, but he declined. Charles Magill Conrad accepted the position. At the Whig National Convention in 1852, Bates was considered for nomination as vice-president on the party ticket, and he led on the first ballot before losing on the second ballot to William Alexander Graham. 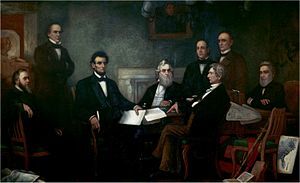 After the breakup of the Whig Party in the 1850s, he briefly joined the Know-Nothing Party but Bates became a Republican, and was one of the four main candidates for the party's 1860 presidential nomination. He received support from Horace Greeley, who later switched to support Abraham Lincoln. The next year, after winning the election, Lincoln appointed Bates United States Attorney General, an office Bates held from 1861 until 1864. Bates was the first Cabinet member appointed from west of the Mississippi River. Bates's tenure as Attorney General generally met with mixed reviews. On the one hand, he was important in carrying out some of Lincoln's earlier war policies, including the arbitrary arrest of southern sympathizers and seditious northerners. On the other hand, as Lincoln's policies became more radical, Bates became increasingly irrelevant. Bates disagreed with Lincoln on emancipation and the recruitment of blacks into the Union Army. In 1864, Lincoln nominated Salmon P. Chase to be Chief Justice, an office Bates had wanted. Bates then resigned and was succeeded by James Speed, a Kentucky lawyer with Radical Republican views. Bates married Julia Coalter from South Carolina. They had 17 children together. She had come to St. Louis to visit her brother David Coalter and her sister Caroline J. Coalter, who married Hamilton R. Gamble (another attorney and Unionist), who ultimately became chief justice of the Missouri Supreme Court. Bates was, for the most part, happy with his large family. His son John C. Bates served in the US Army and later became Army Chief of Staff. During the Civil War, his son Fleming Bates fought with the Confederates, under the command of General Sterling Price. This caused tension between the father and the son, and Bates rarely mentioned Fleming in his war-time diary. His oldest son, Barton Bates, served on the Supreme Court of Missouri during the war. The youngest son, Charles, was still at West Point during the war. ^ Kenneth H. Winn, Missouri Law and the American Conscience: Historic Rights and Wrongs (2016), p. 92. Bates, Edward. The Diary of Edward Bates, 1859–1866, ed. Howard K. Beale. New York: Da Capo Press, 1971. Cain, Marvin R. Lincoln's Attorney General: Edward Bates of Missouri. Columbia : University of Missouri Press, 1965. Mark Neels, "I Will Continue to Make the Best Defense I Can: Edward Bates and the Battle over the Missouri Constitution of 1865", The Confluence, Vol. 5, No. 1 (fall 2013). Wikimedia Commons has media related to Edward Bates.